On Tuesday 28th the VPRF was present alongside numerous MPs and Lords for the annual Dogs Trust Parliamentary Reception. The Rt. Hon. 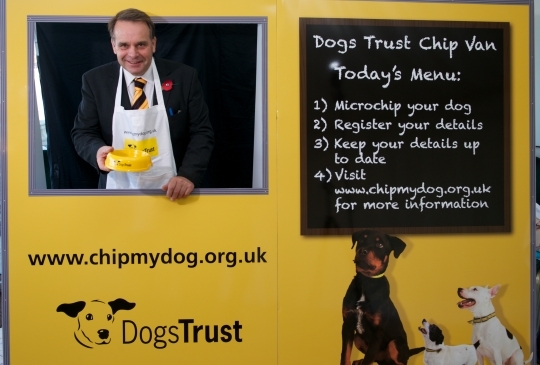 Neil Parish MP climbed into the Dogs Trust Chip Van to serve up some free microchips. During the reception the Minister Lord De Mauley announced that the new regulations on dog microchipping, due to come into force in 2016, would be laid before Parliament the very same day. You can read the draft legislation on the legislation.gov.uk website: The Microchipping of Dogs (England) Regulations 2014. In addition to the news regarding the new legislation, it was announced that Camilla Baldwin OBE, who first joined Dogs Trust in 1974, will be stepping down as CEO to be replaced by Adrian Burder.